DMA-Locker ransomware, which is also known as MadLocker virus, is a new version of infamous CryptoLocker. If you follow news from the cyber world, you have probably heard that CryptoLocker with all its followers has already caused many problems for computer users by taking their personal files to hostage. Therefore, you can expect hazardous behaviour from the DMA Locker virus as well. This file-encrypting virus is even more threatening because it has a direct memory access (DMA) feature which allows functioning directly in computer’s memory. Despite this unique characteristic, the virus spreads and operates similarly as its counterparts. Usually, it travels via malicious email attachments, but it can also enter the system as a Trojan horse. If you want to prevent this unwanted guest’s visit, you have to be very careful online and watch your every click. After one reckless move, you can lose all your important work-related documents and pictures reminding of good old times. However, if the virus got on your computer already, you should not think about data recovery options yet. First of all, you have to remove DMA-Locker from the system using a strong malware removal program, such as Reimage. However, the virus might block access to the security tools or prevent from installing the program. If it happens, follow the instructions presented at the end of the article. .xls, .tif ,.gif, .png, .jpg, .jpeg, ,.bmp, .raw, .max ,.accdb ,.db ,.dbf, .3dm, .mdb, .sql, .wma ,.ra ,.avi, .mov, .3g2, .pdb, .mp4 ,.3gp, .asf ,.asx, .mpeg, .pdf. It encrypts files located on both – compromised computer and network devices. For data encryption, it uses a strong and combined AES and RSA algorithms. After file encryption, all affected files have !XTPLOCK5.0 file extension and become useless. Victims cannot open, view and use their documents, pictures, audio or video files. Well, the only files they can access are the ransom notes. DMA Locker ransomware drops ransom note in .txt and .html files; however, both of them contain the same information. Cyber criminals explain about data encryption process and encourage victims to pay the ransom if they want to get back access to their files. This time hackers ask to pay a ridiculous amount of money – 15 Bitcoins that equals to more than $8000. It’s hard to imagine who is willing to pay so much money. Moreover, there’s no guarantee that after receiving the payment hackers will provide a necessary decryption key and decrypt files safely. Cyber criminals create this kind of viruses to swindle the money, so they rarely help victims with data recovery. We recommend to initiate DMA Locker removal and restore your files from backups. The developers of malware tend to update viruses and make them even more dangerous. Usually, they do it because virus researchers manage to crack ransomware code and create a free file decryption tool. It seems hackers haven’t made enough money, so they keep doing their dirty job. DMA Locker 3.0. As soon as DMA Locker decryption tool has been released, hackers updated the virus. It targets lots of different types of files and encrypts them using a sophisticated AES-256 algorithm. 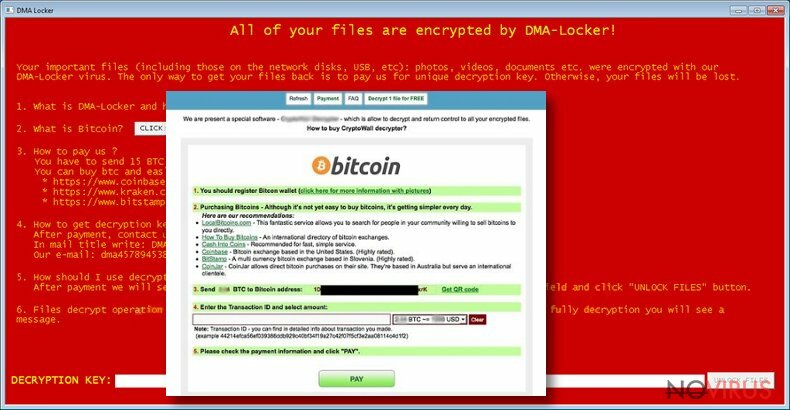 Following the encryption, ransomware drops ransom note where hackers explain that victims need to purchase a decryption key for 4 Bitcoins. According to them, victims cannot restore their files without it. However, we do recommend paying the ransom. DMA Locker 4.0. After few months from DMA Locker 3.0 appearance, virus researchers has discovered a new version of the virus. It spreads via Neutrino Exploit Kit and targets various types of files. Similarly to the previous version, hackers ask to pay the ransom and purchase a decryption key. This time they demand 3 Bitcoins; however, victims should hurry up. Criminals give them a little time to make the payment. If they do not pay in time, the ransom will increase to 4.5 Bitcoins. Take our advice and instead of transferring money, remove the virus from the computer. DMA Locker virus is distributed using various techniques; however, the most popular one is malicious email attachments. Users receive a suspicious spam email where they are asked to open an attachment. They are tricked that sender is from some financial institution, bank, governmental organization or other reputable company, and the provided document is important. Hackers name infected files as receipts, invoices or financial reports, so users tend to open them without any suspicion. Nowadays, computer users should not trust every single email they receive in their inbox. It’s important to double check information about the sender before opening any attached file or link. For DMA-Locker removal we recommend installing one of these programs: Reimage, Malwarebytes MalwarebytesCombo Cleaner or Plumbytes Anti-MalwareMalwarebytes Malwarebytes. Only strong and reputable malware removal tools can eliminate the virus completely. 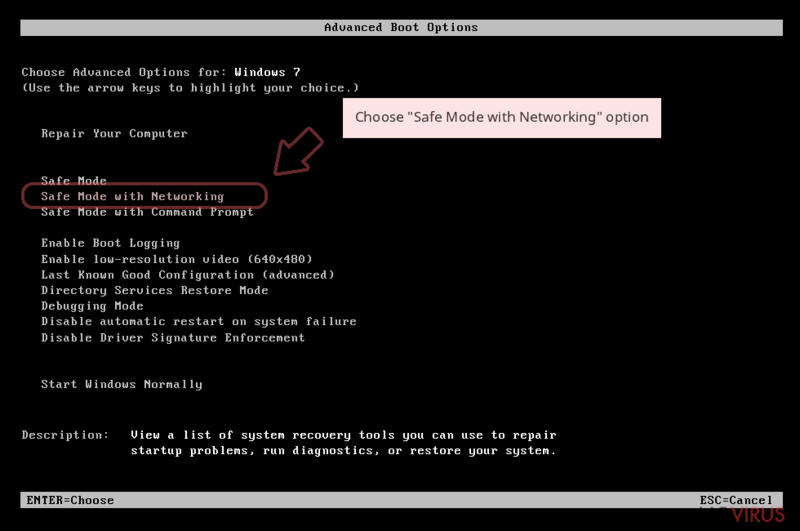 To install or access your antivirus program you have to reboot PC to Safe Mode with Networking. 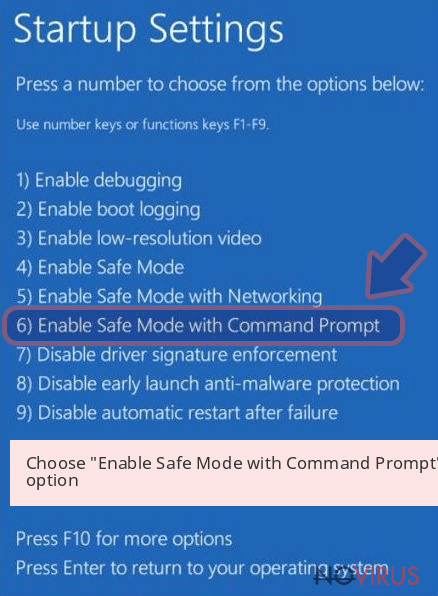 If malware does not allow scanning computer’s system with the program, follow the instruction how to remove DMA Locker under this conditions below. After virus elimination, you can restore your files using either DMA Locker decryption tool or DMA Locker decryptor. Sign in to your account and launch any Internet browser. Download a legitimate anti-malware software, for instance, Reimage. Make sure you update it to the latest version and then run a full system scan with it to detect and eliminate all malicious components of the ransomware to remove DMA-Locker completely. 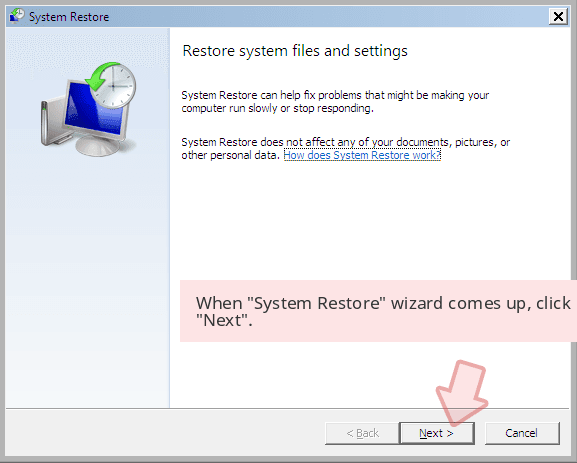 In a new window that shows up, click the Next button and choose a restore point that was created before the infiltration of DMA-Locker and then click on the Next button again. 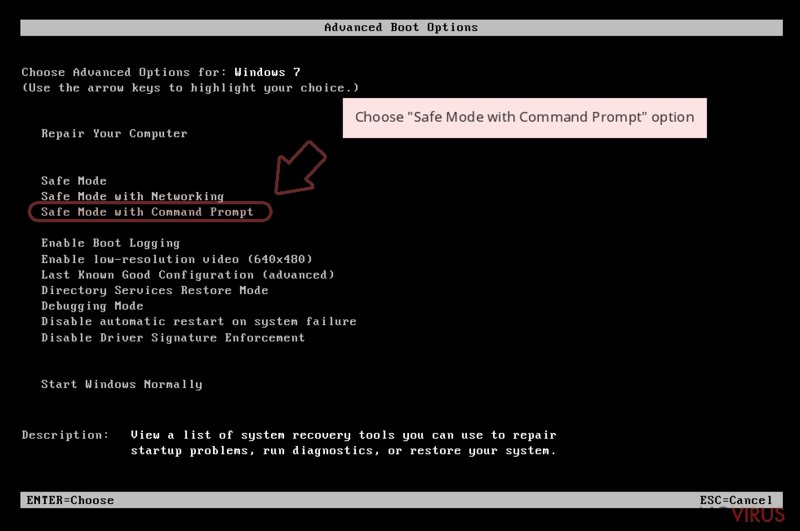 After restoring the computer system to an antecedent date, install and check your computer with Reimage to uncover any remains of DMA-Locker. 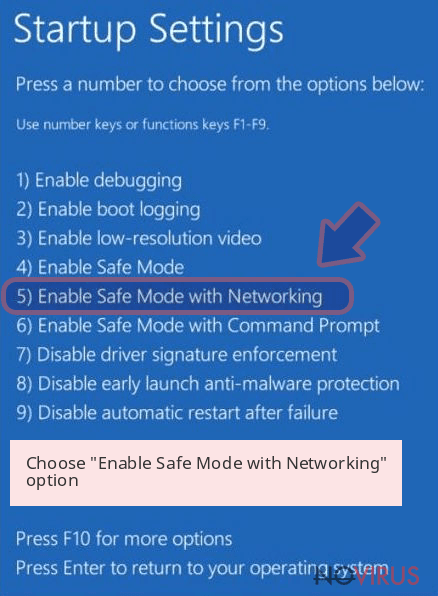 Using the tutorial provided above you should be able to eliminate DMA-Locker from the infected device. novirus.uk team has also prepared an in-depth data recovery guide which you will also find above. To recover encrypted files you can use DMA Locker decryption tool or DMA Locker decryptor. These free tools should help you to restore files encrypted by the first version of DMA-Locker virus. However, if your files are corrupted by latest versions of the malware, you can restore them from backup or using additional methods. Even though, Data Recovery Pro is designed to locate and restore missing files after system wreckage, it migh recove your files as well. 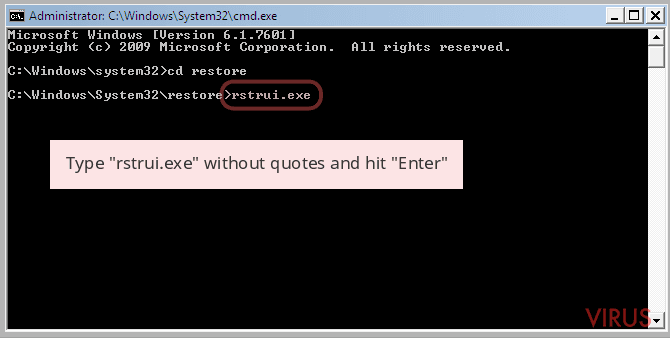 Windows Previous Versions feature allows restoring some of your files. 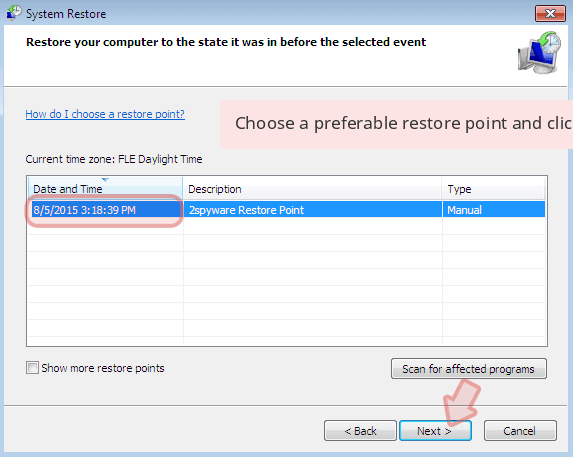 However, you can use this method only if you have enabled System Restore function before ransomware attack. Usually, ransomware viruses delete Volume Shadow Copies from the computer; however, if DMA Locker has failed in doing this, you can use ShadowExplorer to retrieve some of your files. It is strongly recommended to take precautions and secure your computer from malware attacks. To protect your PC from DMA-Locker and other dangerous viruses, you should install and keep a powerful malware removal tool, for instance, Reimage, Malwarebytes MalwarebytesCombo Cleaner or Plumbytes Anti-MalwareMalwarebytes Malwarebytes. This post was published on 2016-10-27 at 13:06. Category: Ransomware, Viruses. What method did you use to remove DMA-Locker virus?